Conrad Anker is one of the greatest mountain climbers on his generation, someone who has scaled peaks from Alaska to Antarctica. In 1999, as part of the Mallory and Irvine Research Expedition to Mount Everest, he found George Mallory’s body 75 years after the pioneering mountaineer vanished during an attempted ascent. Jimmy Chin is a photographer, skier, and climber whose accomplishments have included first ascents in Asia’s Karakoram mountain range and skiing down Everest. Longtime climbing partners, the pair and their friend Renan Ozturk, dreamed of being the first to conquer a peak that has bested many a climber, the Shark’s Fin, a peak on Mount Meru in India, 21,000 feet above the Ganges River. Meru, a breathtaking and intense documentary, directed by Chin and his wife, E. Chai Vasarhelyi, and shot by Chin and Ozturk, spins the tale of two expeditions undertaken by the trio in 2008 and 2011 along with their compelling backstories. The film, the documentary audience award winner at this year’s Sundance Film Festival, is in theaters now where its awe-inspiring images deserve to be seen. Chin and Anker visited San Francisco recently in support of Meru. They are an amiable pair, which isn’t surprising. The film is as much a record of a friendship as it is breathtaking achievement. Their natural habitat may be a precarious alpine perch, but four years after the second expedition and eight months since they started talking about the film at Sundance, they are happy to sit in the confines of a small office and chat about it some more. Q: How does it feel to be down on the ground again? Or, I guess I should say, how does it feel when you are down on the ground? Jimmy Chin: I think we both prefer not be on the ground, normally. We like to be climbing. Your senses are a little bit more firing when you’re climbing. But when we first got down after 2008—I think that feeling’s always very similar. There’s just this tension that, which we love, but after a very sustained amount of time, there’s a big sense of relief. I think the best moment is when we drop the harnesses off and you let them hit the ground. You haven’t been able to drop anything in two weeks. All of the sudden, there’s this moment where you can drop stuff on the ground and it’s almost amusing that you’re not going to lose it forever. Q: What was the first climb you two did together? Conrad Anker: We climbed in Tuolumne Meadows probably 15 or 16 years ago. Then we did a trip to the Palisades range in the Sierras here. Then Pakistan, Tibet, yeah, we’ve been—Jimmy’s my main man. Q: When you are starting a new climbing partnership, how do you do know it’s right? You’re going up with someone you’ve never climbed with before. That takes a great amount of trust. Conrad Anker: We get to get to know each other on a local cliff and shorter climbs, but I’ll know within 15 minutes if I’m going to spend time with a person. That’s how I survive the mountains, because I’m assessing the situation and things like that…Some climbers are completely scattered and some climbers are accident-prone. Some climbers are full of themselves. I don’t want to go do a climb with them. Jimmy Chin: Obviously, for me, there was no question about his legacy and his history as a climber. He was clearly one of the great climbers of his generation. The bigger risk was me for him, because I was this kid that just showed up and didn’t have much of a history. Q: You begin with a shot of the top of Meru and then a shot of your portaledge suspended below the summit. It looks so precarious and really brings home just how vulnerable you are when you’re climbing and exactly what kind of risks you’re taking. Jimmy Chin: Yeah. The weather conditions up there, if it gets bad, and you’re stuck up high, it’s like a tempest. You are very exposed. You’re in one of the most exposed places in the world. It keeps it interesting. Q: What kind of extra challenge does it place on you to be filming? And what kind of difference has the advent of lightweight camera made for you? Jimmy Chin: I think this film is really made possible by the DSLR revolution that happened. The Canon 5D came out and all of the sudden—I’m a still photographer, too—I had this tool that I could shoot both stills and much more cinematic footage that wasn’t possible before. Renan and I would trade cameras. He would shoot when I was climbing and I would shoot when he was climbing. You could shoot this type of material before, but it wouldn’t look the way it does now. That changed, the quality of the footage. In terms of the extra challenge of shooting, it’s a matter of bandwidth. You’ve got a certain amount of bandwidth and a certain of energy and a certain amount of daylight. You have to parse that out between the climbing and the shooting. On a climb like this, you’re always a climber first. In a way, you have to be hyper-efficient, because it’s through your efficiencies that you can find the bandwidth, the time and moments, to shoot. Q: At what point, did you realize that you had an extraordinarily dramatic story? Because this movie isn’t just about trying to conquer this apparently unconquerable mountain, all three of you have incredible backstories that makes the film that much more intense. 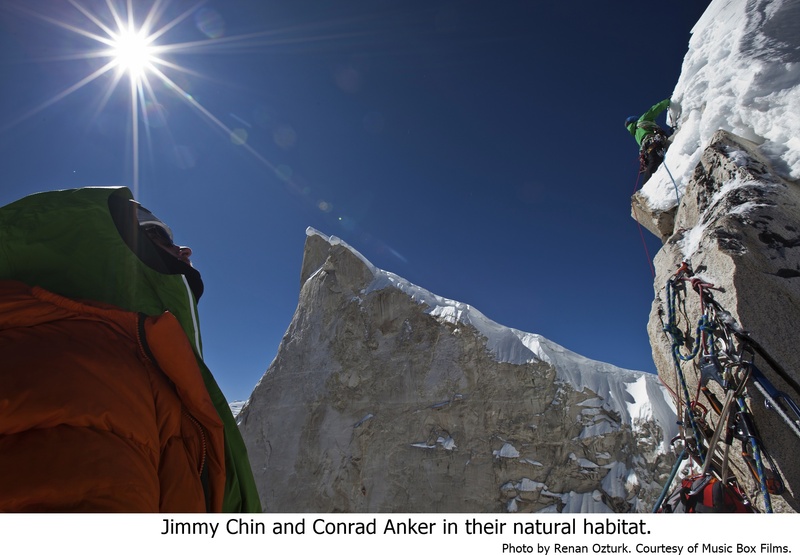 Jimmy Chin: Probably not fully until 2011, after the second climb. I was pretty much focused on surviving…I did know that I wanted to shoot this in the best possible way. Really, because in 2008 we got this footage and we shot a little bit, mostly for posterity, and we looked at and just like the climb, I was like, ‘Oh man, we could do this so much better.’ I started thinking about it as a shooter, as well as a climber. We thought about the climb the second time, ‘How can we do it better? What can we do with less of? How can we trim this down and create a tighter program?’ It was the same with the shooting. I got motivated to shoot it a lot better, but I wasn’t thinking so much about shooting it a lot better for the sake of a film. I thought of it more as shooting it better for the sake of shooting it better. The idea of putting it all together in a narrative and structurally was beyond the scope of what I was even capable of thinking at the time. I was thinking about too many other things. Q: What you guys did with these climbs is just so special. There are so few places on the planet that offer the kind of opportunity that Meru did. Q: Looking at this film, you can’t but think about life and how people choose to live their lives. Jimmy Chin: That’s verbatim what we talk about, Chai and I and Conrad, that the film is about how you choose to live your life, what life you choose to live. But also how complex those decisions are. The thing is, people are always, ‘You’re a climber. You’re one of those crazy climbers!’ Actually, the most successful, the best climbers that I know are hyper-calculated, understand risk at a level that very few people do, and have the capacity to make real complex, logistical decisions—they’re the furthest thing from crazy reckless. Q: With what you do, you so have to trust and depend on your partner. It’s almost like the level of a relationship that most of us don’t experience, because we’re never in that kind of hyper-intense situation. Q: What’s up next for the both of you? Conrad Anker: I’ve got a trip to Nepal on October 24th. Nepal after the earthquake, see how those folk are doing. It’s always a great place to go. They’re such kind people and resourceful people. Conrad Anker: And come back with some wisdom. Jimmy Chin: Yeah, I’m ready for something good. It’s like a purge. I’m sure it’s the same for people who need to go on a yoga retreat or go on one of those retreats where you don’t speak for 10 days. It’s like that. They’re so meaningful and they reset the priorities for you. You appreciate food again. You appreciate your friends. There’s a lot of things you get out of it.